Landscape becomes digital in Richard Kerr‘s minimalist and hypnotic experimental film pictures of sound. 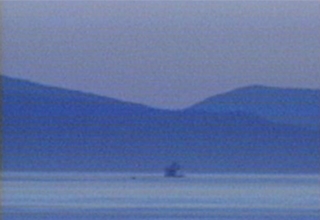 Although the camera was set to record the islands just off of Vancouver, the actual image is so washed out and indistinct, land, water and air are reduced to basic color gradations. Every once in awhile, a boat enters the picture with its arrival punctuated by unnatural digital blurt, accentuating the man-made object’s intrusion into the natural order of things. Except, the image has become so degraded, nothing seems natural any more. Kerr was one of the early members of the Escarpment School film movement in Canada in the late ’70s and ’80s that was centered around activity at Sheridan College. The Escarpment School was a loosely defined group of filmmakers joined by a similarity in themes based around an exploration of landscape and its effect on the personal. A few of Kerr’s own films, like pictures of sound (1998) and Canal (1981), in addition to dealing with landscape, specifically focus on the documentation of waterways. In addition to being connected to themes of the Escarpment School, pictures of sound seems to bear some connection to the landscape films of American experimental filmmaker Larry Gottheim, most notably his famous Fog Line (1970). Gottheim’s film is simply a static shot of rolling hills — no water — covered in a heavy fog that slowly lifts to reveal the grassy fields hidden beneath it. Fog Line has the natural fog obscuring and washing out the landscape in the way that the video achieves the same effect in pictures of sound. However, the main difference is that in Fog Line the image becomes clearer throughout the film, while in pictures of sound, the image becomes more abstracted, going from an obvious, if distorted, vision to a cloud of static. The static in pictures of sound also has the odd effect of introducing a simulation of natural movement that’s not available in the clearer images. While there’s no perfect rhythm to the static, its jumping around mimics the roiling of water in a rapid waterway. As if to further cement the connection between the static and the motion of water, the last minute or so of the film is, in fact, a closer look at the water with no connection to the island beyond seen in the film’s first half. The only way we can definitively know we are looking at water in this final shot is the inclusion of one last boat — also much closer than the ones we saw before — traversing its surface. Richard Kerr has several more experimental films on Vimeo and you can read more about him at his official website. Also, if you go to his website, check out his amazing film strip light box displays and installations. Lastly, Kerr is currently a professor at the Mel Hoppenheim School of Cinema at Concordia University in Montreal.